What happens when you google ‘Google Monopoly’? 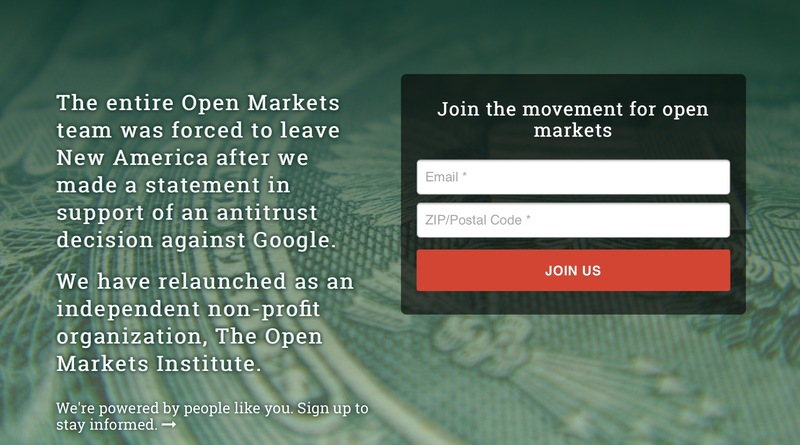 A warm welcome to the Open Markets Institute – the new home for the anti-monopoly team led by Barry Lynn at the New America Foundation. It is quite a story. The Open Markets team was forced out of the New America Foundation think tank on August 31. The story began nine weeks earlier, when they put out a statement welcoming a European antitrust action against Google for its abuse of monopoly power. Google complained to New America’s leadership. Two days later, the team was given notice. The only good news was the media response. The coverage of Google flexing its muscles and their dismissal shone a light on the threats that monopoly power poses. Kenneth Vogel’s initial article ran on the front page of the August 31 New York Times. Thoughtful articles and editorials have been published since in 300 mainstream media outlets, including the Economist, the Washington Post, the Financial Times and the Wall Street Journal. The best tradition of open markets thinking, from Karl Popper onwards, has always favoured the equitable distribution of power. There is no such thing as an open market where monopolies set the terms of trade. So what happens when we all google ‘Google Monopoly’? The think tanks that retail ideas in today’s world may be subject to corporate pressure, but ideas themselves are free. They are free to resist.